Current projects: Quantum Critical Behavior in Fermion Systems, Using the generalized fermion bag algorithm, Applications to Graphene and Unitary Fermi Gas. 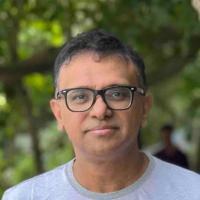 Research Description: Prof. Chandrasekharan is interested in understanding quantum field theories non-perturbatively from first principles calculations. His research focuses on lattice formulations with emphasis on strongly correlated fermionic systems of interest in both condensed matter and nuclear physics. He develops novel Monte-Carlo algorithms to study these problems. He is particularly excited about solutions to the notoriously difficult sign problem that haunts quantum systems containing fermions and gauge fields. He recently proposed an idea called the fermion bag approach, using which he has been able to solve numerous sign problems that seemed unsolvable earlier. Using various algorithmic advances over the past decade, he is interested in understanding the properties of quantum critical points containing interacting fermions. Some of his recent publications can be found here. Critical Phenomena and Monte Carlo Algorithms. Ayyar, V; Chandrasekharan, S, Generating a mass gap using Feynman diagrams in an asymptotically free theory, edited by Della Morte, M; Fritzsch, P; Gámiz Sánchez, E; Pena Ruano, C, Epj Web of Conferences, vol. 175 (March, 2018), pp. 11010-11010, E D P SCIENCES [doi] [abs]. Ayyar, V; Chandrasekharan, S; Rantaharju, J, Benchmark results in the 2D lattice Thirring model with a chemical potential, Physical Review D, vol. 97 no. 5 (March, 2018), American Physical Society (APS) [doi] [abs]. Banerjee, D; Chandrasekharan, S; Orlando, D, Conformal Dimensions via Large Charge Expansion., Physical Review Letters, vol. 120 no. 6 (February, 2018), pp. 061603 [doi] [abs]. Ayyar, V; Chandrasekharan, S, Generating a nonperturbative mass gap using Feynman diagrams in an asymptotically free theory, Physical Review D, vol. 96 no. 11 (December, 2017), American Physical Society (APS) [doi] [abs]. Huffman, E; Chandrasekharan, S, Fermion bag approach to Hamiltonian lattice field theories in continuous time, Physical Review D, vol. 96 no. 11 (December, 2017), American Physical Society (APS) [doi] [abs]. Prof. Chandrasekharan is interested in understanding quantum field theories non-perturbatively from first principles calculations. His research focuses on lattice formulations with emphasis on strongly correlated fermionic systems of interest in condensed matter, particle and nuclear physics. He develops novel Monte-Carlo algorithms to study these problems. He is particularly excited about solutions to the notoriously difficult sign problem that haunts quantum systems containing fermions and gauge fields. He recently proposed an idea called the fermion bag approach, using which he has been able to solve numerous sign problems that seemed unsolvable earlier. Using various algorithmic advances over the past decade, he is interested in understanding the properties of quantum critical points containing interacting fermions. Some of his recent publications can be found here.